We’re dedicated to sharing as much information about health and wellness with our community (and the world at large!) as possible. As a team, we often find ourselves recommending books to our clients. It’s our pleasure to be able to provide them easily to you, now available in our retail boutique. We look forward to adding to our selection over time. For now, we’ve selected a three of our favorites. Books are priced at the manufactured suggested price printed on each book. This book is such an insightful read about all things related to being a woman. Chapters are devoted to everything from our eggs to uterus, menstration, menopause, hormones, breastfeeding and everything in between. The writing is rich and elegant. The information shared is both scientifically accurate layered with philosophical insights and musings. We’ve referenced this book so many times around our Women’s health Q & A event. 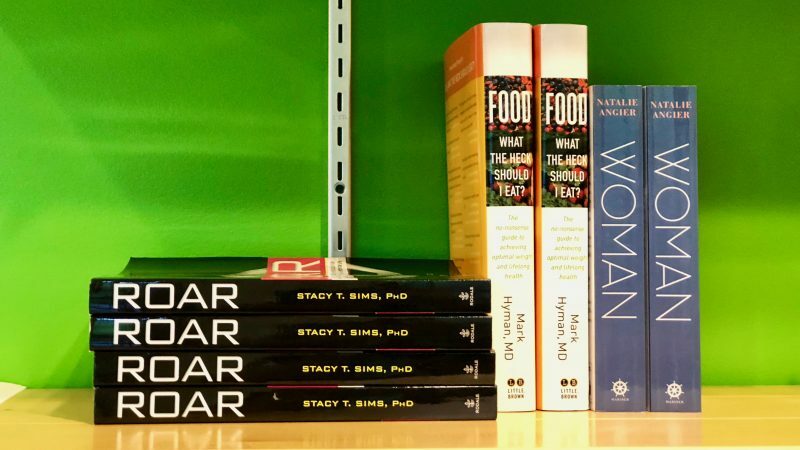 It is a gem of a read, focusing on all aspects of women’s health from nutrition, to exercise and everything in between menstruation, childbirth and menopause. Hyatt Training is a collective of certified, enthusiastic and innovative personal trainers in Portland, Oregon. Our core values are the heart, soul and guiding principals for every decision day in and day out. Staying true to a steady set of values ensures our clients receive consistent results for their entire personal training experience. Belief in education for our clients, ourselves and the community at large is a huge part of who we are. We’re passionate about creating an environment where both clients and trainers thrive. While we take what we do very seriously, we refuse to take ourselves too seriously. Having fun along the way is important to us. We promise our clients they’ve never had so much fun working so hard! To learn more about our personal trainers, or to set up a free consultation to see how they could help you, email us at Go@HyattTraining.com.